It’s official – there will be an EdCampME (Maine) this March and Waynflete will be hosting! Our TLC (Technology & Learning Cohort) came up with the idea after a bunch of us attended EdCampKeene in August. We all enjoyed the “camp” and came back thinking that it would be a great thing to put on at Waynflete. That enthusiasm did not die so we began laying some groundwork to bring EdCampME to Waynflete. I had several initial conversations with the Head of School and Director of Finance and Operations and they both gave me the go ahead to find a date. Finding an open date was a little tricky as our facilities are used a lot on the weekends for Admission events, athletics, and arts. I found a few options in March which is a good month overall because it is between sport seasons, it is just before the “end of the year” craziness begins, and stress levels seem to be in check. After a few more conversations, I found a date that would work and got full approval for a weekend in March and reserved the space. Before I left for the weekend, I decided to post the date on the main EdCamp website and reserve a website wiki – EdCampME.wikispaces.com. (Seem to make it even more official). On Saturday morning I woke up and checked my twitter feed and found that the “edcamp guy” (@dancallahan) had tweeted that he was looking forward to EdCampME in March (yay – instant press). 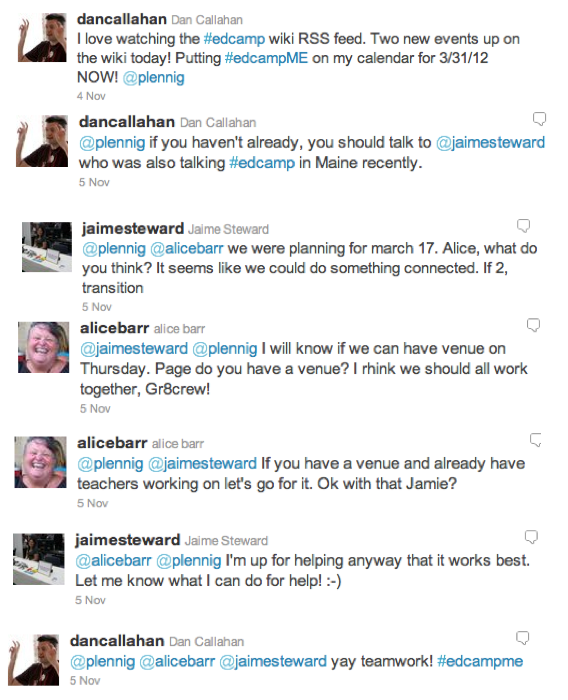 Then he followed up that tweet a little later telling me to check in with @jaimesteward who (along with @alicebarr) was also planning an EdCampME. I checked the edcamp site and sure enough, she had put an entry in for EdCamp Maine for March 17th. What are the chances? Now we have 10 teachers from Waynflete plus an additional 5 or 6 educators from the whole state working together to plan this EdCamp for March 31st. Now the fun begins. To get things started I created a Google Doc to share with everyone to begin brainstorming some ideas for the day. Once we get the big picture down, we can begin to assign jobs. This entry was posted in EdCamp, education, professional development, teaching, technology, TLC and tagged EdCampME on November 10, 2011 by plennig.